The key is to check the level of your oil. But first, let’s look at that engine oil - aka liquid gold! The two basic elements of engine oil are the base oils and the additives, and the two work alongside each other to produce the final product that you put in your car’s engine. How’s this for an analogy - think of a screwdriver cocktail, with orange juice as the base and vodka as the additive. Voilà! Engine oil is the golden liquid that keeps your car happy by lubricating the moving parts of the engine. If the moving components are not gliding past each other nicely, this will cause friction, and friction in the engine is not, to put it mildly, a good thing. What will happen if I ignore an oil leak? If you ignore that oil leak (we’ve all done it - hoping, wishing and praying it will magically disappear), your car will keep running until the oil runs dry. Without it, the engine will be damaged and may seize up. It is the only way to determine if your car is safe to drive. The level of your oil on the dipstick should always be between the minimum and maximum markers - 10 points if you get it right in the middle! For the record, it is never, ever, a good idea to use your car if the oil level is below the minimum marker. This will lead you down the path of severe engine damage or even engine failure. Why does my car have an oil leak? 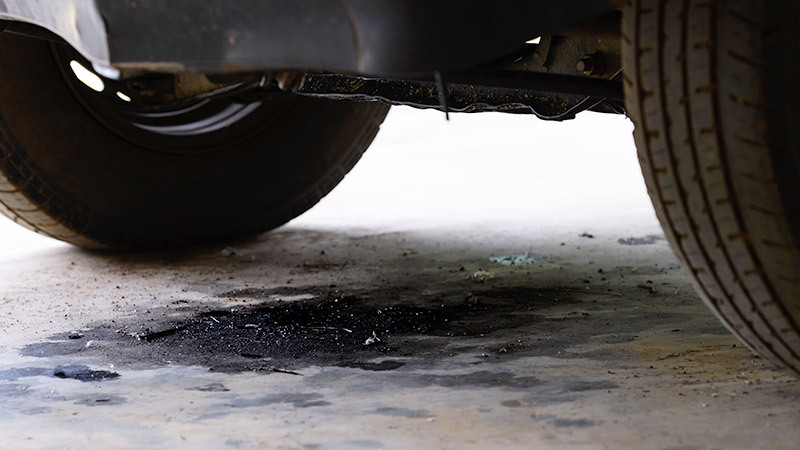 Oil pan leaks can occur when the underside of the oil pan is physically damaged. Oil ring may be seized into the piston and not sealing correctly, causing oil to burn. A sign of this is white smoke coming from the exhaust. What are the signs of an oil leak? The most obvious sign that you have an oil leak is the great big puddle of oil where your car was parked. Smoke coming from your engine (caused by oil dripping onto the exhaust manifold). Your dashboard is lit up with an oil light warning. The engine is overheating due to the oil level dropping too low. The not-so-sweet smell of burning oil combined with a sizzle, sizzle noise! This isn’t the delicious smell of bacon, it’s the bitter smell of burning oil hitting your engine. Should I get an oil leak fixed as soon as possible? Driving with an oil leak means extra wear and tear on your vehicle as well as engine damage. If you have an oil leak, don’t waste time, take it to your mechanic. He/she will be well versed as to what causes an oil leak, what to look for and how to fix it. Don’t despair if you can’t get to your mechanic straight away. There are budget-friendly remedies available that can buy you time, including a stop-leak additive available from your local automotive store for as little as $10. Keep in mind, though, that no leak can truly be fixed by a chemical additive and it is imperative to get your car to your mechanic as soon as possible. TIP: Check your engine oil on a weekly basis, especially if your car has done a lot of kilometres. Being pro-active today could save you thousands in the future! And luckily, AutoGuru makes it easy to book your car into a mechanic to get that oil leak fixed up in no time! You can compare quotes from local mechanics, and know what you're paying before you even arrive. Fionna is the owner of Southeast Auto Mechanical in Beenleigh, Queensland. A former lawyer, Fionna decided on a radical career change, qualified as a light vehicle mechanic and took over Southeast Auto in 2016. As well as delivering quality service to their customers, Fionna and her team run an award-winning, free car maintenance workshop program for women.